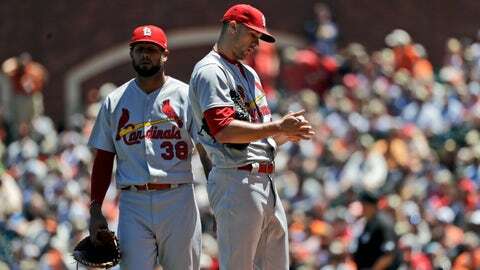 Starting pitcher Jack Flaherty was pulled after giving up three runs over 2 1/3 innings in the Cardinals' loss to the Giants on Sunday. SAN FRANCISCO — At some point, Giants manager Bruce Bochy plans to give Pablo Sandoval a day off. It’s just that Sandoval’s bat, coupled with a slew of injuries in San Francisco’s infield, is making it increasingly difficult to rest the portly third baseman. Sandoval homered and had five RBIs to back an uneven start by Madison Bumgarner as the Giants beat the St. Louis Cardinals 13-8 on Sunday. Andrew McCutchen and Alen Hanson each added three hits. Brandon Belt and Gorkys Hernandez had two apiece to help the Giants split the four-game series. Bumgarner (2-3) earned his second win this season despite an erratic outing. Making his seventh start after missing the first two months with a broken left pinkie, Bumgarner allowed four runs and seven hits in 5 1/3 innings. He walked two and hit a batter with a pitch. The Giants bailed out their ace with a pair of three-run innings and a five-run sixth while setting a season high for scoring. After José Martínez’s RBI single off Bumgarner in the fifth put St. Louis ahead 4-3, San Francisco rallied against reliever John Brebbia. Belt doubled and went to third on All-Star Brandon Crawford’s single. Sandoval followed with his eighth home run, a three-run drive that bounced into the waters of McCovey Cove. “(Brebbia) left it there right in the happy zone,” Sandoval said. Sandoval added a two-run single in the sixth. The five RBIs were one shy of his career high. Brebbia (1-3) also took the loss against the Giants on Friday. Matt Carpenter hit his 17th home run and Yairo Muñoz also went deep for St. Louis. Cardinals starter Jack Flaherty gave up three runs, two earned, in 2 1/3 innings. San Francisco traded OF Austin Jackson, RHP Cory Gearrin and a minor league player to the Texas Rangers for a player to be named or cash. Center fielder Steven Duggar and right-hander Ray Black made their major league debuts for the Giants after getting called up earlier in the day. Duggar went 2 for 6 with a double, and Black allowed three runs and retired one batter. Cardinals: CF Tommy Pham left in the seventh with a bone bruise after fouling a ball off his left foot. X-rays were negative. … C Yadier Molina sat out for the second consecutive day because of soreness in his right shoulder. … OF Dexter Fowler was back on the bench, one day after making his first start since June 27. Giants: Hernandez exited with a tight calf after hitting a two-run single in the sixth. Derek Holland, who has been pitching out of the bullpen lately, was brought in as a pinch-runner. Hernandez is likely to miss at least one game, Bochy said. Cardinals: All-Star RHP Miles Mikolas (9-3, 2.63 ERA) starts Tuesday in Chicago against the White Sox. Mikolas matched his career high for walks in his last outing but is second in the NL in fewest free passes per nine innings (1.4) among qualifying pitchers.